There was Poland before the wall came down and Poland after the wall came down. And the only difference in time was a year. The first time was in the late spring of 1989, the second the summer of 1990. I was 11 and 12 those years and always very perceptive to what was going on around me, even if I didn’t speak the Polish language, or really even the language of adults. We spent both holidays in a tiny little village called Rodowo, which can be found in the north of the country, south-east of Gdansk, equal distance from both Poznan and Warsaw. The nearest town that I remember going to was Prabuty, and it isn’t too far from the town of Malbork. I’m quite familiar with village life as I was born in a very small one in England, and spent a lot of my summers as a teen living and working in one. Rodowo was (and still is according to Google Earth) tiny: farms, a small church, a village shop and a school with one main road. The first year we went to Poland we traveled by train. We lived in The Netherlands at the time, Apeldoorn, and took a night train from Hengelo to Poznan. Europe was still divided into two sections, West and East, and visas were required to go from one to the other. We traveled in a 6 seat cabin, the seats becoming beds, 5 of us (two adults, three children) and I feel like the trip took days, although it was most likely about 12 hours. I have always loved traveling by train, watching the world go by from the window, imagining myself running alongside the train, jumping over hedges and fences, peering into houses and skimming over bodies of water. Train journeys can be very relaxing and enjoyable. This one was just that until we got to the East German border, when the train came to an abrupt halt and all cabins were searched one by one (and I still remember how scary and brusque those guards were, a lot less relaxed than the West German ones). We were there for ages, waiting. And then again just after the West Berlin stop, when all of a sudden the train became full to the brim with passengers carrying heavy bags, laden with things to sell back home. The narrow hallways of each wagon were full of people standing; the journey to the toilet at the end of the row became a mini obstacle course, clambering over people, bags and boxes. When we arrived in Poznan we climbed out of the window and were helped down by people waiting to board the train, it was easier than trying to get out through the hallway and carriage door. This was my first exposure to the “East”. It still amazes me how two sides of a continent could be so different, all because of the way they were governed. And this was on the very tail end of Communist rule in Eastern Europe – Solidarność flags were flying everywhere, and that summer for the first time in decades Poland would experience significant governmental changes. The Berlin Wall came down about half a year later, and with that the USSR’s last fingers were removed from the East. I now wish I had been a little older and able to fully understand the revolution that was happening in Poland while I was there! A year later we flew to Poland, Schiphol to Warsaw, which also happened to be the first time that I had ever flown anywhere. It was a lot less eventful than the trip the previous year, and the changes in the country were already quite visible, at least in the cities and towns. Rodowo was still the same really: quiet, small and undisturbed. I think the changes I noticed the most were the availability of things (things being items that as Westerners we were so used to seeing in shops that we noticed the lack of them while traveling). While in 1989 items such as jeans, American cars as well as the actual ability to BUY were coveted, in 1990 Capitalism was already infiltrating the country rapidly. I can’t imagine how strange it would have been to go from the austerity of Soviet Communism to Western Capitalism without any real preparation time. I remember that people thought that we could just buy anything without any worry; it was as if the “West” was full of golden opportunities and consumer items, which in a sense wasn’t entirely false, just not completely true either. We were treated as royalty by my stepfather’s family in Rodowo, but because we were family, not because we came from Western Europe. In my mind Rodowo was a place untouched by time, moving along at its own pace, and I suppose it is still quite similar today (although I do hope that the farmers are able to use more up-to-date machinery!). Polish hospitality remains second to none in my mind – the way my stepfather’s family took us in and looked after us was just wonderful, leaving me with a lifetime of memories. After living in (big) cities for many, many years, I remember waking up in Poland as something so very special. The warm sun rays coming through the window, the sound of birds chatting away, the occasional shout, moo of a cow or the noises of a tractor heading out into the fields. Cioca (aunt) Monica bustling around, preparing breakfast for us, and a feast it was, every single day. I doubt that these were everyday breakfasts, but they were made for us every day and I still remember how amazing the honey was, straight from the beehives, spread lavishly on the warm, freshly baked bread. I would move there in an instant, just for a taste if that again! I never was much of a meat-eater, even at that age, and even though I’ve been a vegetarian for nearly 20 years now, I still remember actually enjoying the kielbasa on the farm. And the taste of freshly milked cow’s milk, warm and creamy, so good that you were quickly able to get over the smell of cow and down it in one go. Homemade butter on warm bread. My gosh, I even ate some of the chicken that Cioca Anja had killed in front of us earlier in the day, bravely watching her behead it, averting my eyes away from the bucket that it was draining in after the fact. The food on the farms was plentiful, wholesome and delicious, everything was fresh and mostly homemade, even the cheese. A lot of vodka was also consumed, even in the morning, Wujek (uncle) Tadek would have his shot before going out into the fields, but obviously I didn’t partake in that at the time (although I did develop a taste for Polish vodka quite a few years later). Despite Rodowo being a small village there was so much for us to DO. 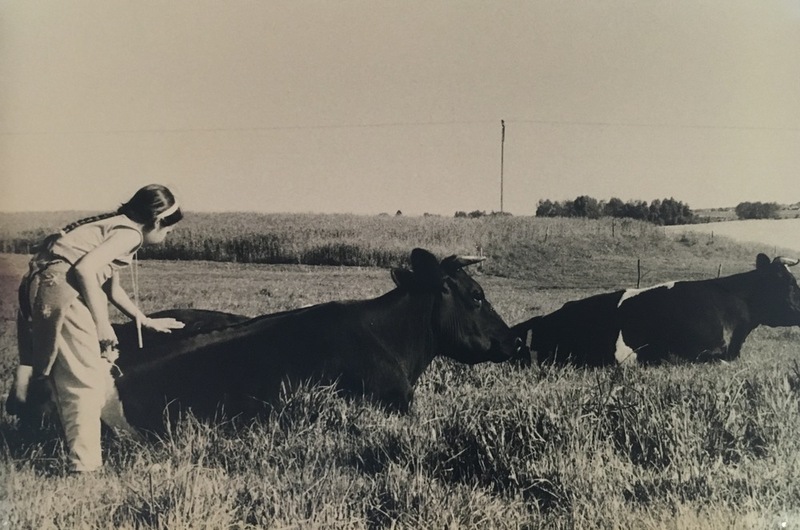 I spent a lot of time doing my favourite thing in the world, reading, in the fields by the farmhouse, or running around with my sister discovering the barns and the fields, talking to the cows and chasing the dogs. There were pigs and hens and horses, and so much land to roam around on. If you have never spent hours sliding down haystacks then I really recommend it (don’t wear shorts though), as well as running through corn fields and getting slightly lost. I don’t recommend falling in cow patties (as my sister did), or jumping into a field with a bull, but they are also interesting experiences in hindsight. Cioca Monica and Wujek Tadek’s son Rysek also lived on the farm, as well as his son Adam. Rysek was (is still most likely) an amazing traditional Polish wood carver, and he would create beautiful sculptures and statues out of simple logs of wood. He made us all one each, mine of course being the only different one, painted in black. He was trying something new at the time and I told him how much I loved it, so it became mine. He was one of my favourite people in Poland; he always had time for us, and always seemed so happy and carefree. Adam was also wonderful and loved playing with my little brother Dylan, and if I remember correctly Dylan adored him. Dylan was only just 2 years old when we first visited Poland, but I think he remembers a lot of both trips. I’m so thankful that my mother was such an avid photographer from an early age and documented so much of our lives. It really helps to relive moments when you capture a shot of yourself right there, and there are quite a few of me walking through the fields, lost in my thoughts. Cioca Monica and Wujek Tadek’s farmhouse was both very, very old, and modernized enough to have all the features of comfort that you need to live (modern plumbing, electricity etc). There were no showers, but then again, most older houses in England didn’t have showers at the time either! You couldn’t have too many electrical devices running at the same time unless you wanted to blow a fuse, but that wasn’t anything strange either. While there was a toilet in the house, there was also an old outhouse made of wood by the pig sty that most people seemed to prefer. Maybe because it was away from the house? A little bit of peace and quiet from us kids running around and creating mayhem? Who knows! Maybe it was just a quiet place to sit and read the paper without anyone bothering you… I do love old farmhouses and would love to live in one one day. We made friends with the children of the village, even though we didn’t speak the same language. Fun is a universal word, and we had loads of it, running around everywhere together. Małgosia, Magda and Piotr were our main go-to kids as they were Anja’s daughter and niece and nephew (the same lady who killed the chicken with her bare hands and gave us the fresh cow’s milk), and we got up to so much mischief with them! We hid eggs in the field and waited until they had gone rotten and smashed them, running away from the stink in hysterics. Touching the electric fences and jumping with the shock was another favourite pastime, as well as playing hide and seek in the barns. Karli and I found Cioca Monica’s boxes of old clothes in the attic of one of the barns and spent a day playing dress up and making up plays. I only remember warm, sunny days, but I’m sure there were some days of rain too… On one of our visits we went to a nearby lake where we jumped around in the water and grilled kielbasa and where I also learnt what a leech was and how to get rid of them (I think the incident actually happened to my poor sister, not me though). Now thinking of it, Karli had more than enough little traumas while we were there… She stubbed a toe pretty hard and a doctor put a cast on her leg, right up to her knee. And then someone decided that it was completely unnecessary and it was sawn off right there in the farmhouse. I can’t imagine that that was a very safe procedure, but she luckily still has all of her toes! There was a gorgeous boy there, his name Andzej, and we communicated via smiles and signs. He would ride around on his bike and just looked older and more interesting than the others. One day he asked me to go for a ride with him on his bike, and being too shy I said no. Of course he then asked another girl and I wanted to kick myself… Ah the fickle nature of young love. I made my mother take a photo of him so I could look at it when we got home, and imagine marrying Andzej and living in Rodowo on our farm. When I look at it now he looks so young, as young as we all were then. Kids playing in the fields, running through the corn and chasing the chickens. I even tried my hand at actually milking a cow and collapsed in a fit of giggles when I couldn’t do it. The village church was small, but still lavish from what I can remember, or maybe just lavish from all of the beautiful flowers that were everywhere. There was a service every day, late afternoon during the week, and I recall going quite regularly… I was christened Church of England but had been receiving a Catholic education at the time, and was a little confused about what I believed in. Churches still help me to gather my thoughts even today, and I think it was mainly a time for me to have a little space and a little calm. Being the oldest of three, with two siblings who were a lot louder and more rambunctious than myself, as well as being sensitive to the ups and downs of our family life at the time I think the respite was often needed. And thinking about it now, my father had only died a year or so before, so I must have liked to seek solace in something more powerful and bigger than the little 11 or 12 year old that I was. We participated in the First Communion celebrations for the kids in the village and also in a tradition where we were dressed in traditional Polish clothing and walked through the village throwing rose petals at designated spots along the way. While I’m not religious in any shape or form I have a soft spot for traditions and there were some lovely Polish ones that I adored around different holidays. Traditions are kept going strong in all Polish immigrant families across the world, and it’s wonderful to see them passed down generation to generation. Both of my trips to Poland were over 20 years ago and while some of the memories are as clear as day, others are slightly hazy, and for some things I had to dig quite deep into those memory drawers. I didn’t remember a trip into Gdansk until my mother reminded me of it, and I have a slight recollection of touring the school in Rodowo, but I don’t remember why we did it. Maybe there was some interest in us living there at some point? On our second trip my stepfather made the journey into the Soviet Union, to see family that had stayed there, and there was so much trouble getting visas and travel permits beforehand. Nowadays it’s hard to imagine entire families being displaced across the world, sometimes even letters or packages not getting through borders. It’s difficult to imagine not being able to do a quick Google search and find a family member online, or not being able to Skype or FaceTime across time zones. But less than 30 years ago you couldn’t even visit the USSR without a visa, without most likely being followed and checked out and documented somewhere in the system. And if going there was hard enough, getting out was even worse. These trips didn’t involve extensive sightseeing of Poland’s famous cities, but they did help me learn about the everyday life in an Eastern European country, and also about how strong family ties can be, even when borders and time make it difficult, even impossible to communicate with each other. One day it would be lovely to go back and visit, or at least find out what has become of all of the wonderful people that made these holidays so magical. *There are many, many stories of Polish displacement in the 1940’s, stories of pogroms in what we now call the Ukraine against Jews and Poles, stories of slave labour in Siberia and stories of refugee camps. Many of these stories have never been told and are just passed along to family members. Many of the people who experienced these atrocities are not here anymore, or are very, very old. For more information you can check out this website on displaced persons here, or on this site here which explains how many Poles arrived in the UK after the war. Ryszard Rabeszko's wonderful wooden carvings, still with us today here in the US.